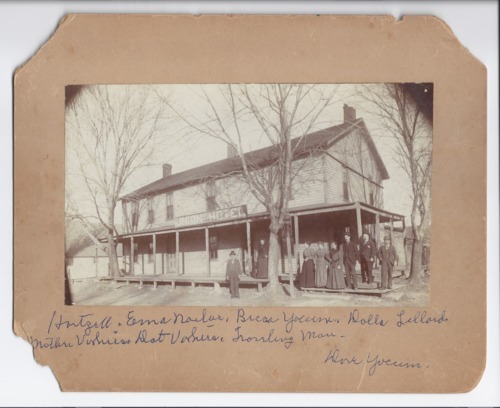 A photograph of Dave Hartzell, Emma Nailer, Rebecca Vorhies, Dollie Lillard, Mr. and Mrs. Vorhies, Dave Yocum, and Bradley (traveling man) standing outside the Union Hotel in Rossville, Kansas. In 1871, on the corner of Pearl and Perry streets, A.C. Sherman constructed the first hotel in Rossville. M.V. Lee operated the hotel until June 1877 when he sold it to Mr. O. Woods, who sold it in 1878 to S.B. Maxwell, who then renovated the hotel. The hotel became known as the Maxwell House. A.W. Gabbey, son of Dr. Gabbey, purchased the hotel and renamed it The Rossville Hotel, operating it until Mr. and Mrs. Charles Vorhies took ownership of the pictured Union Hotel in 1898. They continued running the business until it burned on February 14, 1901. This photograph is provided through a pilot project to host unique cultural heritage materials from local libraries on Kansas Memory and was accomplished by mutual agreement between the Northeast Kansas Library System, the Rossville Community Library, and the Kansas Historical Society.